Text message marketing & communication for restaurants, bars, lounges, and other food and beverage establishments is the most cost-effective & quickest method to reach your customers. In fact, 98% of all text messages are read and 90% of those messages are read in 3-minutes or less! Engaging your customer base utilizing text messaging will help promote daily specials, happy hour times, live music, coupons, and just about anything you can think of to your target customers and get their attention within minutes. Below, you’ll see how large restaurant chains are using the same technology we offer at TXT180 with amazing results! As you can see, the potential with text message marketing for restaurants is very significant! It’s more cost effective than direct mail, print ads, and has up to 10X higher coupon redemption rates!!! 1- Start our 15-day free trial here. There’s no credit card required and this will allow you to test the system and how it will work for your restaurant without any obligation. 2- Upon signing up for your trial, you’ll be asked to choose your Keyword. The keyword will be the word that people text in to join your text group. A lot of people choose their business name or a word commonly associated with their business. For example, Joe’s Pizza could choose Joes or Pizza as their keyword. *Tip, avoid choosing a keyword that will auto-correct or is hard to spell. 3- Decide whether or not you’d like to set up an auto-responder. The auto-response message is the message that anyone who joins your text club will be automatically texted when they text in to join your list. You choose what the message says and you can change the auto-response message at any time. 4- Promote your text group. The true key to success with having a text message club is gaining as many members as possible. That way when you’re having a slow day or simply want to increase business, you can send out a text to your group members and get your message seen within minutes. 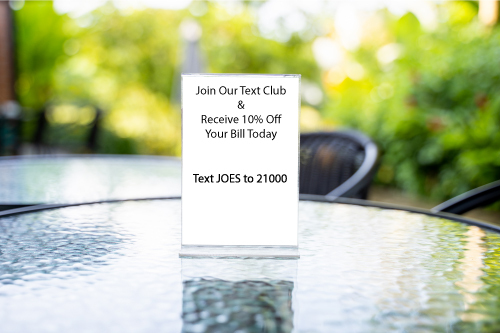 The best way to get people to join your restaurant’s text club is to use an incentive to join. Everyone enjoys something to sweeten the deal. You could offer to comp the sodas on the ticket, 10% off, a BOGO offer, or whatever works best for your establishment. The better the offer, the higher the response will be. We recommend offering something that will seem of high value to your customers but is a low cost to your business to give away. Sodas are a great example. Another great perk of using text messaging software is that you have so many features built in to optimize your restaurant’s results. Send messages on demand or schedule messages days, weeks, or months in advance to automate your marketing and messaging. Go through the calendar and set up all of your holiday & specials texts at once and then rest assured that your text will be sent to all current members of your text list on the scheduled date. Drip messages are another way to automate your restaurant’s marketing. A drip message simply means messages that are scheduled to go out based on the date someone joined your text list. 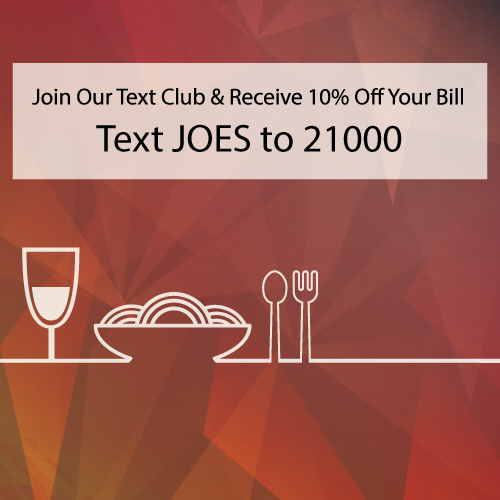 For example, all members could receive the 10% offer joining your text club. Then you can set the next message to go out 5 days later with either another offer or just a reminder of what your weekly specials are. Each person who joins your club will receive that second message 5 days after they joined the club. You can set as many drip messages as you’d like. This ensures all members of your club receive the same messages at the same increments of time, based on the time they joined. The inbox is a great way to automate customer service. 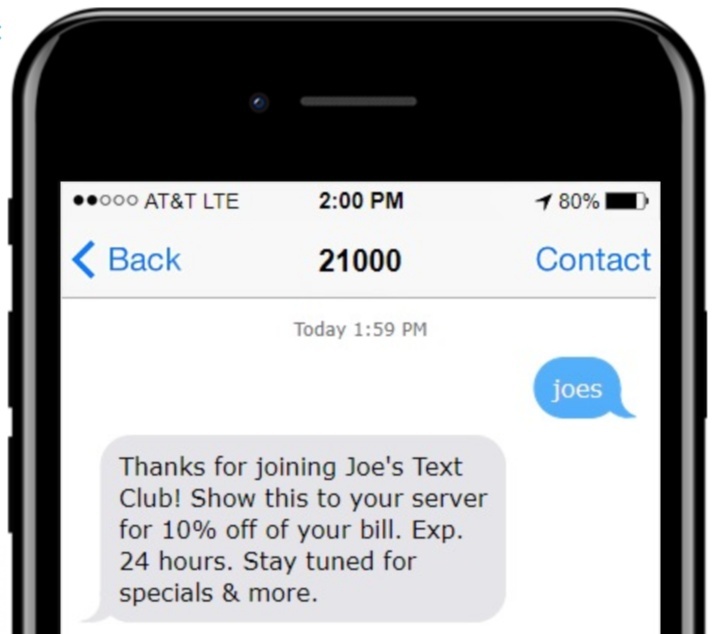 The inbox feature is 2-way text enabled so if a customer texts your club back asking what your hours are or if you’ll be open for Thanksgiving, you have the chance to respond via text message which has become the preferred method of contact for many. Our inbox feature can alert of the message to your personal cell phone or email. Use our message templates to save messages you may want to send out another time to save time having to re-enter the text information. The dynamic date feature is great for restaurants that want to offer coupons via text message. The dynamic date can be entered into your text message, for example, Recieve a FREE breadstick with purchase of a slice and a drink expires +7 days. The +7 days is the dynamic date. Our software will automatically calculate what the date will be in 7 days from the time you sent the text message so that you can ensure that it will be set to expire in 7 days from the time they received the message. These are a few examples of the bulk text messaging features that our software includes. To view the full list of texting features click here. Make sure to send something of value. When your customers sign up to receive texts from you, they’re allowing you to contact them on their personal cell phone. Make sure to think of what types of messages/offers you’d appreciate from your favorite restaurants. It doesn’t always have to include a discount. Don’t overdo it. Make sure not to spam your customers by texting them too much. We recommend 6-8 texts a month for restaurants. We find that a lot of our clients that are restaurants send 1 message per week and see great results. If you’re new text bulk text messaging all of this can feel overwhelming but we promise once you get going it’s a lot easier than it seems. We recommend if you’re new that you utilize our complimentary Customer Success Managers to help you set up your account and go over ideas on how to integrate texting for your restaurant so that you know you’ll be set up for success and save time. SMS Marketing for restaurants has been proven to be highly effective. The sooner you start and the better you promote it, the better your results will be. Text messaging is only growing in usage and popularity every day. Utilize that fact to generate more revenue and customers for your restaurant. If you have any questions about how this can work for you please reach out to our team and we’re more than happy to help you.